American crane and materials handling manufacturer Terex and Finnish lifting business company Konecranes have announced a merger, creating a new company to be named Konecranes Terex Plc and incorporated in Finland. 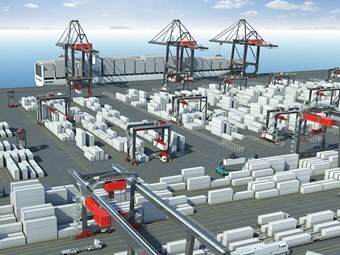 A Konecranes terminal container-handling system. Terex shareholders will own about 60 percent of the combined company, with Konecranes shareholders owning the remainder. Estimated pro forma 2014 revenues and EBITDA (earnings before interest, taxes, depreciation, and amortization) are US$10.0 billion and US$845 million, respectively. The companies say that the move "will bring together two complementary leaders in cranes, materials handling, and equipment servicing solutions to create a premier industrial company". Among the benefits to both companies are: an increased global scale, enabling the companies to become more competitive against low-cost emerging market players; a broader presence in key sectors with greater opportunity to capitalise on growth trends in the port and industrial sectors; and better opportunities for R&D. "This merger brings together two great businesses and through synergies provides another lever that is within our control to deliver value-creation to both the shareholders of Terex and Konecranes," Terex CEO Ron DeFeo says. "We have a deep respect for Konecranes and look forward to joining forces with them to build a stronger and more diverse company that will be in an excellent position to succeed in a dynamic and highly competitive global industry." Konecranes chairman Stig Gustavson echoes the sentiments, saying: "The combination of Konecranes and Terex is a defining step in the history of both companies. "With a focus on lifting and material handling solutions, Konecranes Terex will be in an excellent position to deliver enhanced growth in revenue and margins through several strategic advantages, including significant cross-selling opportunities," he adds. "There is a common culture between the two organisations, with both companies having long histories of designing competitive and innovative solutions. Together, we will have the opportunity to expand what Konecranes and Terex have built and become even stronger in the future." 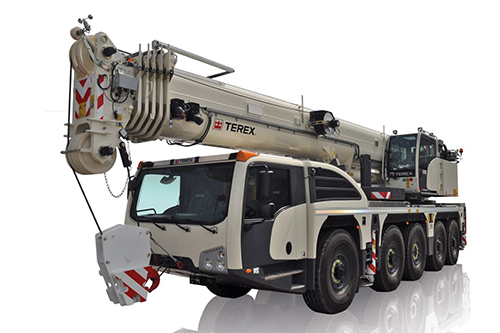 The Terex Explorer 5500 crane. The transaction is subject to approval by Terex and Konecranes shareholders, regulatory approvals and customary closing conditions. Closing is expected to occur during the first half of 2016. The new company will have five Terex directors and four Konecranes directors. The Konecranes chairman and the Terex CEO will become, respectively, the chairman and the CEO of the combined company. With headquarters in Westport, Connecticut, USA, and Hyvinkää, Finland, Konecranes Terex Plc is expected to have about 32,000 employees worldwide. The combined company is planned to be listed on Nasdaq Helsinki and the New York Stock Exchange. Click here to find Konecranes equipment for sale.